Understanding your revenue and cash flow help you make smart decisions for your pet care company. Before growing your business - it is extremely important to have a firm grasp on the financials and the business analytics. Understanding all of the data your business produces helps you in making smart, informed decisions. Here at Time To Pet - we track lots of different business data. Things like monthly growth, churn rate (the percentage of clients who cancel each month), customer acquisition cost, trial conversion rates, revenue per customer and many more. While the data you track may be different than us - there are still a lot of items you can measure to help you grow your business in the most effective way. Using business metrics to help grow your company is more than just tracking the data in Quickbooks. You need to be able to chart and visualize your data to help you make important business decisions. Should you discontinue your dog running service? Is it worth moving into a new zip code? Can you afford to hire a new office manager? What can you afford to spend to gain a new client? You may have a gut feeling on these decisions but what happens if your gut is wrong? It can be catastrophic for your business. Not that you should never trust your gut - but using a combination of your gut and the cold hard data that your business metrics provide can help turn that catastrophic decision into the best decision you ever made. The simplest thing you can track for your pet sitting or dog walking business is revenue. Revenue is the amount of money your company brings in during a specific period. While revenue data alone can be really nice to see - it doesn’t tell you much. Calculating the growth rate can really tell you how your company is doing. 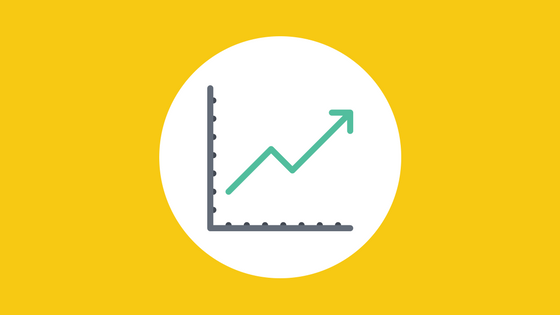 Understanding your growth rate helps you better determine the increase in your revenue. For example - a company that went from $1,000 to $2,000 in revenue is a lot different from a company that went from $50,000 to $51,000. While both grew their revenue by $1,000, the smaller company that doubled will most likely be ecstatic and the larger company may be disappointed in that growth. I’ve highlighted negative growth in red and positive growth of 10% or more in green. You can see that January tends to be much slower than the previous December. May also seems to have the most growth year over year. This company can be sure they have the correct amount of staffing for these months based on the the previous years data. You’ll also notice that they grew by 82% in 2015 and 76% in 2016. Pretty impressive numbers! When you chart things like revenue - you are looking for the graph to smart small and then get bigger and bigger. Charting growth rate is different. Because growth is exponential - you are really looking for anything that doesn’t decline. For example - if your company has $1,000 in revenue and grows by 20% - you are now at $1,200 in revenue. That is an increase of $200. Now if you take that $1,200 and grow by 20% again - you are at $1,440. That is an increase of $240. Growing at the same rate will grow your revenue exponentially. Even though the company that grew by $1,000 a month started off better, the company with continued 20% growth was much larger after 2 years. Continued steady growth is the Holy Grail for any business. Cash flow is the lifeblood of a small business and pet sitting and dog walking companies are no exception. In order to keep the lights on (both literally and figuratively) - you need cash on hand. Cash Flow is the amount of money flowing into and out of a business. While there aren’t as many fancy graphs for cash flow - it’s essential that you have a good grasp of how much cash you have on hand today and how much you can expect to have in the future. Why is this important? Let’s look at a scenario. You believe your company is primed for serious growth based on your revenue and growth rates but you are nervous that with the growth - you will have to spend more time managing your business and less time growing it. You decide you want to hire a part time office manager. Can you afford them? Let’s take a look. Even though their revenue is higher, this company would have ran out of money at the end of April forcing them to make some really tough decisions - possibly even letting their new Office Manager go after just 4 months. If this company could have held off hiring for a few more months until they had more cash on hand - they would have been successful. Understanding your financial metrics helps make really smart, informed decisions for your pet care company! After mastering your Revenue and Cash Flow metrics, you should take a close look at your Pet Sitting Expense Metrics.